We have sourced a lovely local stockist in Charlestown, called The Craft Kiln. I just happened to be visiting for lunch and saw they were looking for new suppliers. I have a shelf space, near the front door and the window area where you can the mermaids and faeries floating. 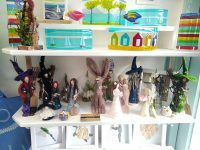 The shelf space will be displaying our witches, wizards, maidens and hares. I plan to visit each month to keep it fresh and appealing! So far, they have been selling wonderfully well which is really exciting and rewarding.